This research further reveals that demand for composite materials in the aerospace sector is expected to witness the maximum growth among all sectors. Construction and transportation are anticipated to witness good growth in the next five years. Carbon fiber composite applications are expected to grow more rapidly compared to glass fiber applications. In the future, the author expects higher market fragmentation for the industry due to the emerging economies coming into play. The future market is expected to be highly competitive, and companies with innovative capabilities can be anticipated to thrive and gain market share. This report provides a concise overview of the global composites market. The study contains detailed analysis of different raw material use such as glass fiber, carbon fiber, aramid fiber, UPR, epoxy, vinyl ester, phenolic, polyurethane and thermoplastic resin. - Market size and growth rates of the global composites market. - Market for FRP and advanced composites. - Global composites industry size in terms of value and volume. 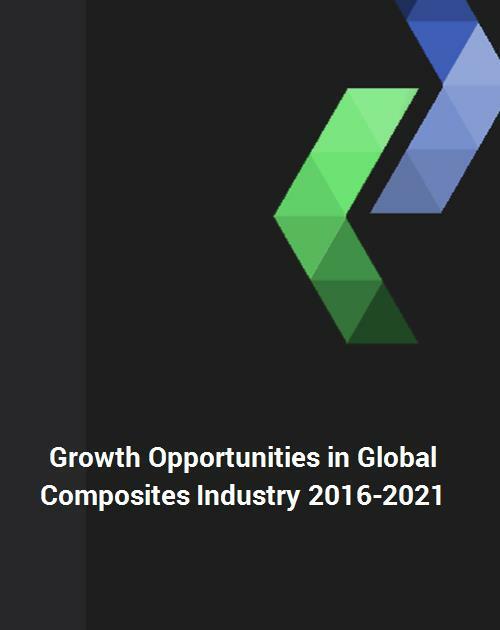 - Global composites industry trend (2010-2015) and forecast (2016-2021) in terms of value and volume by application, such as Transportation, Marine, Wind energy, Aerospace, Pipe and tank, Construction, Electronic & Electricals, Consumer goods, and Others. - Market size estimates of global composites by molding compounds. - Market size estimates of global carbon fiber market by tow size, pan and pitch type. - Market size estimates of glass fiber and by type of product form. - Material price and property comparison. Fiber and resin price history and forecast. Material prices of fibers, resins, fabrics, prepregs, adhesives. Figure 5.1: Schematic Representation of Uncured Polyester Resin. Figure 5.2: Schematic Representation of Cured Polyester Resin. Figure 5.3: Schematic Representation of Uncured Vinyl Ester Resin. Figure 5.4: Schematic Representation of Cured Vinyl Ester Resin. Figure 5.5: Global Composites Market Distribution (Million Pounds) by Thermoset and Thermoplastic Resin Composites in 2015. Figure 5.6: Global Composites Market Distribution (Million Pounds) by Resin Type in 2015. Figure 5.7: Global Composites Market Distribution ($M) by Resin Type in 2015. Figure 5.8: Global Composites Market Shipment ($M) by Resin Type in 2015. Figure 5.9: Global Composites Market Breakdown by Resin Type in 2015. Figure 5.10: Global Thermoset Composites Market Breakdown by Resin Type in 2015. Figure 5.11: Resin Material by Shipment (million Pounds) in the Global Composites Industry 2015. Figure 5.12: Global Resin Shipment ($M) by Resin Type in 2015. Figure 6.1: Advanced Composites Market Share in Global Composites Industry in 2015. Figure 6.2: Advanced Composites Market Size (Million Pounds) in Global Composites Industry in 2015. Figure6.3: Advanced Composites Market Distribution ($M) in Global Composites Industry in 2015. Figure 6.4: Advanced Composites Market Size ($M) in Global Composites Industry in 2015. Figure 6.5: Raw Material Shipment (Million Pounds) in Global Composites Industry in 2015. Figure 6.6: Global Composites Market Breakdown (%) by Raw Materials Used in 2015. Figure 6.8: Raw Material Distribution in Global Composites Industry in 2015. Figure 6.9: Global Composites Market Distribution by Thermoset and Thermoplastic Resin Composites in 2015. Figure 6.10: Global Composites Market Shipment (Million Pounds) by Thermoset and Thermoplastic Resins in 2015. Figure 6.11: Global Composites Market Shipment ($M) by Thermoset and Thermoplastic Resins in 2015. Figure 6.12: Global Thermoplastic Composites Breakdown by Product Form in 2015. Figure 6.13: Global Thermoplastic Composites Shipment (Million Pounds) by Product Form in 2015. Figure 6.14: Global Thermoplastic Composites Breakdown $M by Product Form in 2015. Figure 6.15: Global Thermoplastic Composites Breakdown $M by Product Form in 2015. Figure 6.16: Molding Compounds in Global Composites Industry in 2015. Figure 7.2: Global Composites Distribution (Million Pounds) in 2015 by End Use Application. Figure 7.3: Global Composite Shipments by Market Segment in 2015. Figure 7.4: Global Composites Distribution ($M) by Market Segment in 2015. Figure 7.36: Composites Distribution in Global Construction Industry in 2015. Figure 7.37: Composites Shipment (Million Pounds) in Global Construction Industry in 2015. Figure 7.44: Corrosion Market Breakdown by Type of Applications. Figure 8.6: Hand Lay-Up and Spray-Up Process Distribution by Application in 2015. Figure 8.11: Pultrusion process Distribution (Million Pounds) by Market in Global Composites Industry in 2015. Figure 8.12: Open and Closed Molding Distribution in Global Composites Market in 2015. Figure 8.13: Open and Closed Molding Shipment (M lbs) in Global Composites Market in 2015. Figure 9.8: Global Composites Market ($M) by Region in 2015. Figure 9.13: Growth Rates in Various Market Segment of North American Composites Industry in 2015. Figure 9.15: US Composites Shipment Trend by Market Segment (1970-2015). Figure 9.19: Average Annual Growth Rates in Various Market Segments of t Asian Composites Industry from 2010 to 2015. Figure 9.27: Global Composites Market Forecast (2016-2021). Figure 9.28: Global Composites Market Forecast by Region (2016-2021). Figure 9.29: Global Composites Shipment (Million Pounds) by Region in 2021. Figure 9.30: Global Composites Market ($M) by Region in 2021. Figure 9.31: Global Composites Market by Region in 2015. Figure 9.32: Growth Opportunities in Various Market Segments (2016-2021). Figure 9.34: Growth Forecast in Global Composites Shipment by Market Segments in 2016. Figure 9.35: Average Annual Growth Forecast in Next Five Years (2016-2021) in Global Composites Shipment by Market Segments. Figure 9.36: Global Composites Shipment (Million Pounds) by Market Segment in 2016. Figure 9.37: Global Composites Shipment (Million Pounds) by Market Segment in 2021. Figure 9.38: Global Composites Shipment ($M) by Market Segment in 2021. Figure 9.40: Average Annual Growth Forecast in Next Five Years (2016-2021) in North American Composites Industry by Market Segments. Figure 9.41: North American Composites Distribution (Million Pounds) by Market Segment in 2016. Figure 9.42: North American Composites Distribution (Million Pounds) by Market Segment in 2021. Figure 9.43: North American Composites Shipment ($M) by Market Segment in 2021. Figure 9.44: European Composites Shipment by Market Segments Growth Forecast in 2016. Figure 9.45: Average Annual Growth Forecast in Next Five Years (2016-2021) in European Composites Shipment by Market Segment. Figure 9.46: European Composites Distribution (Million Pounds) by Market Segment in 2016. Figure 9.47: European Composites Distribution (Million Pounds) by Market Segment in 2021. Figure 9.48: European Composites Shipment ($M) by Market Segment in 2021. Figure 9.49: Growth Forecast in Asian Composites Shipment by Market Segment in 2016. Figure 9.50: Average Annual Growth Forecast in Next Five Years (2016-2021) in Asian Composites Shipment by Market Segment. Figure 9.52: Asian Composites Distribution (Million Pounds) by Market Segment in 2021. Figure 9.53: Asian Composites Shipment (Million Pounds) by Market Segment in 2021. Figure 9.54: Open and Closed Molding Shipment of the Global Composites Market in 2015. Figure 9.55: Open and Closed Molding Shipment of the Global Composites Market in 2021. Figure 9.56: Open and Closed Molding Shipment of the Global Composites Market in 2021. Figure 9.57: Global Composites Distribution (%) by Manufacturing Process in 2021. Figure 9.58: Global Composites Shipment (Million Pounds) by Manufacturing Process in 2021. Figure 9.59: Global Composites Distribution ($M) by Manufacturing Process in 2021. Figure 9.60: Global Composites Shipment ($M) by Manufacturing Process in 2021. Figure 10.1: Global Composites Market by Region in 2015. Figure 10.2: Global Composites Market Shipment by Region in 2015. Figure 10.3: Regional Growth (M lbs) in the Composites Industry in 2014 vs. 2015. Figure 10.8: Composites Potential for Top 12 Leading Countries of the World. Figure 10.9: Composites Distribution by Country of North American in 2015. Figure 10.10: Composites Shipment (M Ibs) in North American Countries in 2015. Figure 10.11: Composites Shipment Distribution in European Countries in 2015. Figure 10.12: Composites Shipment in European Countries in 2015. Figure 10.13: Composites (Pounds) Per Capita in European Countries in 2015. Figure 10.14: Composites Shipment Distribution in Asia-Pacific Countries in 2015. Figure 10.15: Composites Shipment in Asia Pacific Countries in 2015. Figure 10.16: Composites (Ibs) per Capita in Asia Pacific Countries in 2015. Figure 10.17: Composites Market Distribution by Application in North America in 2015. Figure 10.18: Composites Shipment (Million Pounds) in Various Application in North America in 2015. Figure 10.19: Composites Shipment ($M) in Various Application in North America in 2015. Figure 10.20: European Composites Distribution by Market Segment in 2015. Figure 10.21: Composites Shipment (Million Pounds) in Various Application in Europe in 2015. Figure 10.22: Composites Shipment ($M) in Various Application in Europe in 2015. Figure 10.23: Composites Market Distribution by Application in Asia in 2015. Figure 10.24: Composites Shipment (Million Pounds) in Various Application in Asia in 2015. Figure 10.25: Composites Shipment ($M) in Various Applications in Asia in 2015. Figure 11.2: Global Composites Market Breakdown (Million Pounds) by Raw Material used in 2015. Figure 11.5: Gross Profit ($M) in Raw Material (Reinforcement and Resins) Market in 2015. Figure 11.7: Market Distribution (%) by Value ($) of the End Product. Table 1.1: Global Composites Market Parameters and Attributes – Materials Perspective. Table 1.2: Global Composites Market Parameters and Attributes – End Product Market Perspective. Table 7.1: Impact Properties of Some Selected Materials.